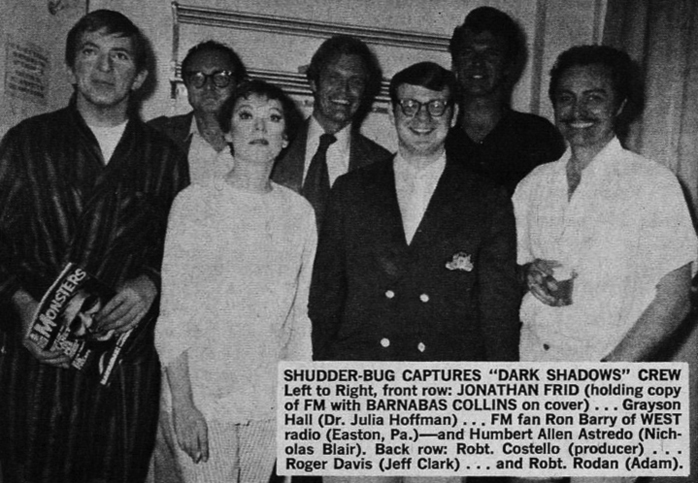 My knee-jerk response upon discovering this story many years ago was, "Why did it take so long for Famous Monsters to discover DARK SHADOWS?" This was a TV series definitely in the wheelhouse of FM major domo Forrest J. Ackerman, even before the addition of Frankensteins, wolfmen and zombies to the mix. 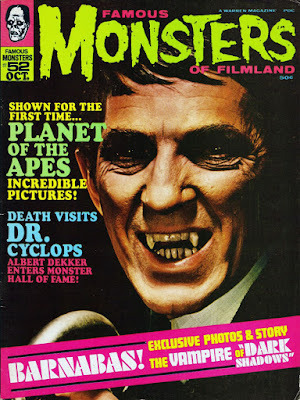 Barnabas Collins first made the scene in the spring of 1967, yet it took Famous Monsters until the following Halloween to get around to addressing DARK SHADOWS. 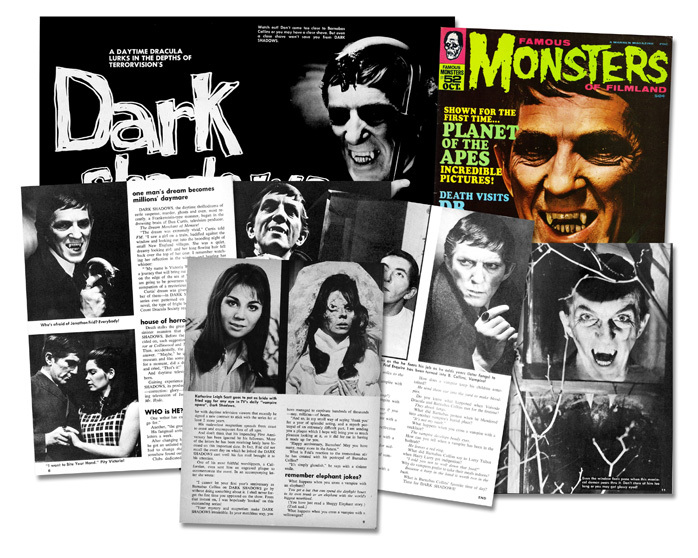 Below is the magazine's first feature on DARK SHADOWS, which had already become a cultural phenomenon by the time this issue was published. But publishing schedules can be a little misleading. Dated "October, 1968," comic books and magazines have a history of intentionally mislabeling publication dates to make them seem more timely. 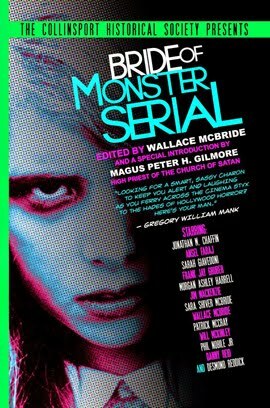 Factor in the lead time needed for physical production of a magazine and it's likely that Famous Monsters might begun work on this story many, many months earlier. 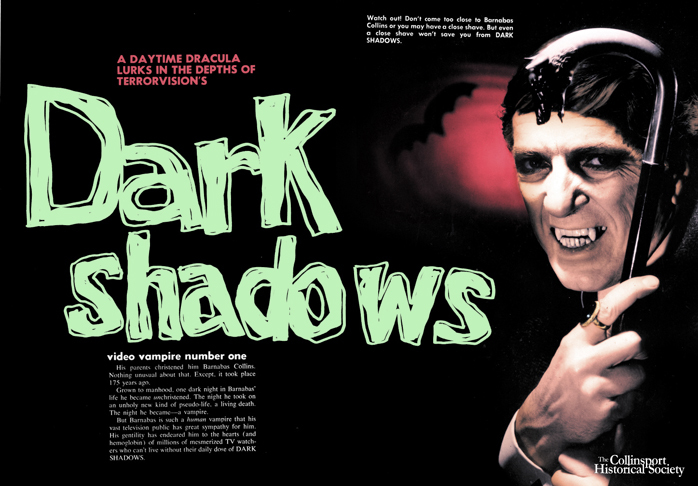 Below is the text of the DARK SHADOWS feature from Famous Monsters #52 as it originally appeared, in all its cheesy glory. Whenever possible I used crisp scans of the original photos that accompanied the feature. I also went all Ted Turner with the feature's opening spread, colorizing the image and text for no other reason than the novelty of it. His parents christened him Barnabas Collins. Nothing unusual about that. Except. it took place 175 years ago. Grown to manhood. one dark night in Barnabas' life he became unchristened. The night he took on an unholy new kind of pseudo-life. a living death. The night he became — a vampire. But Barnabas is such a human vampire that his vast television public has great sympathy for him. His gentility has endeared him to the hearts (and hemoglobin of millions of mesmerized TV watchers who can't live without their daily dose of DARK SHADOWS. Left: Who's afraid Of Jonathon Frid? Everybody! Right: "l want to Bite Your Hand." Pity Victoria! 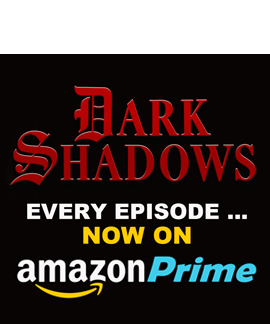 DARK SHADOWS, the daytime thrillodrama of eerie suspense, murder, ghosts and even, most recently, a Frankenstein-type monster, began in the drowsing brain of Dan Curtis, television producer. The Dream Merchant Of Menace!
" 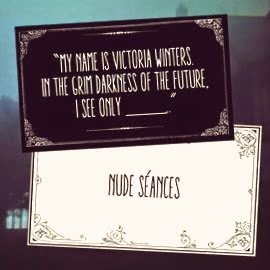 'My name is Victoria Winters. I am going on a journey that will bring me to a strange dark house on the edge of the sea at Widow's Hill. There, I am going to governess to a young boy and the companion of a mysterious woman.' 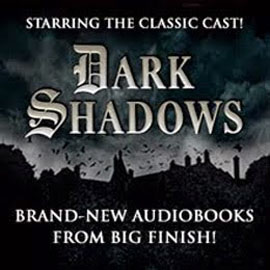 "
Curtis' dream was given body — in fact a number of them — in DARK SHADOWS, the first TV series ever patterned on the lines of the Gothic novel, the type of fright book that members of the Count Dracula Society read for bedtime stories. 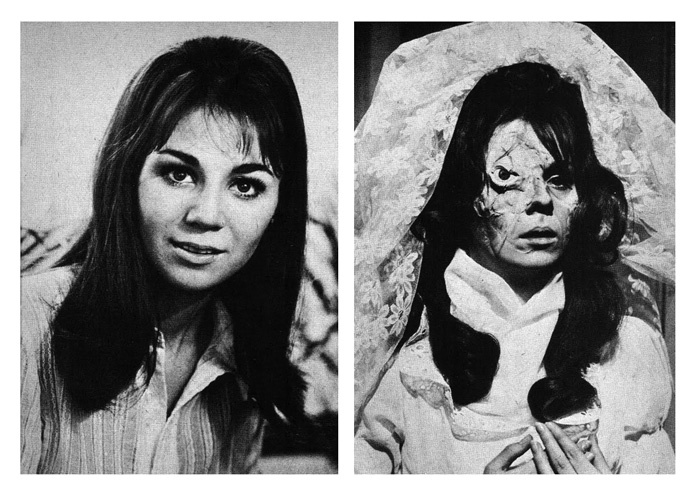 Katherine Leigh Scott goes to pot as bride with fried egg for any eye in TV's daily "vampire opera", Dark Shadows. 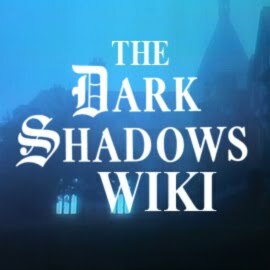 Death stalks the great halls of Collinwood, the sinister mansion that is the locale of DARK SHADOWS Before the series. 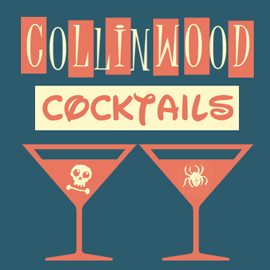 final title was decided on, such suggestions were considered as Terror at Collinwood and The House on Widow Hill. Then, accidentally, the producer stumbled on thee answer. "Maybe," he quipped. "I should go to a museum and film some dark shadows." He mused for a moment, did a devil-take, slapped his horns and cried, "That's it!" 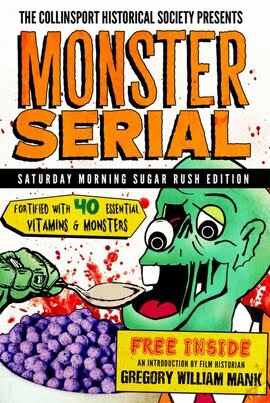 And daytime television's spookiest show was born. Gaining experience in the eerie from DARK SHADOWS, its producer covered himself with gory —correction: glory—by masterminding the exciting televesion of Jack Palance as Dr. Jekyll Mr. Hyde. One writer has called him "the ghoul the girls go for." His fangmail arrives in sacks at the rate of 2000 letters a week. After changing his phone number several times he got an unlisted number. And after a short while had to change that because too many admirers somehow found out where to call him. Clubs dedicated to him have sprung up like mushrooms all over the nation. 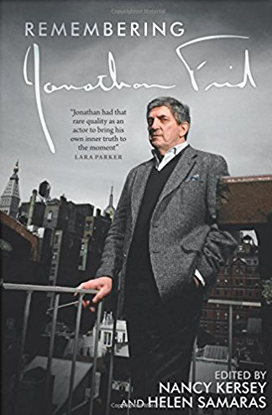 At night when he removes his fangs (from a victim's throat, that is) he is really mild-mannered Clark Kent—correction, Jonathan Frid. Of English, Danish and German ancestry, he stands 6' tall, weighs 175 lbs., and has brown hair and hazel eyes. And speaking of having hazel eyes, Hazel says she'd like to have them back. Canadian born, the acting bug bit him when he was in college. After graduation he went to England to study at the Royal Academy of Dramatic Arts and appeared on the stage in 1949 & '50. 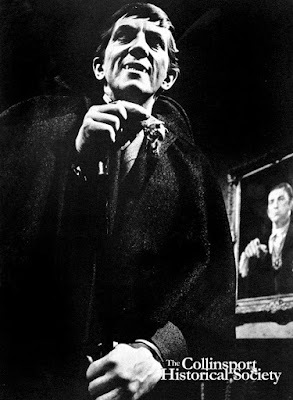 Asked about his working habits while portraying Barnabas Collins, Jonathan Frid told FM: "When I leave the studio I go home and work 2 or 3 hours on the script. I have no social life at all. I must get up at 6:30 or 7 and work for an hour over breakfast going to the studio. At the studio I work on the script all day long, when I'm not rehearsing." And remember: before you can rehearse you have to hearse! "I play Barnabas as a lonely man with a conscience," Frid continued. 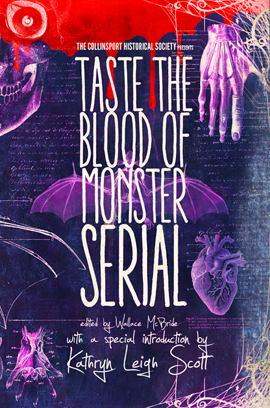 "He is a guilt-ridden monster because of his need for blood. But he is also a sympathetic human who yearns to be a normal man. My character is unpredictable: I'll go along for a while being very quiet & tragic, then suddenly I'll lunge as the lust for blood overwhelms me. 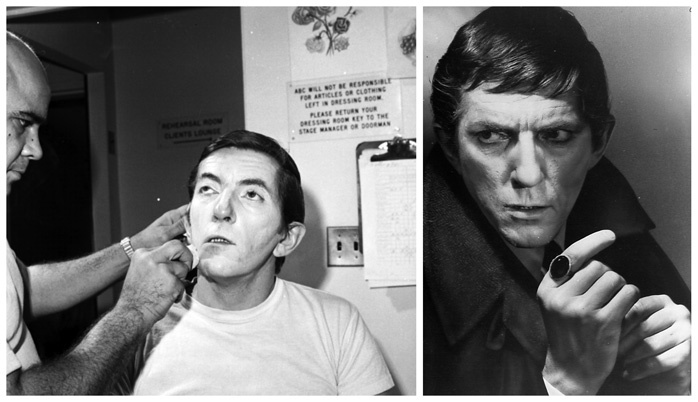 Even the make-up artist (left) looks as tho he fears his job as he adds years (later fangs) to the face of Jonathon Frid. ABC is the network that features Barnabas Collins. 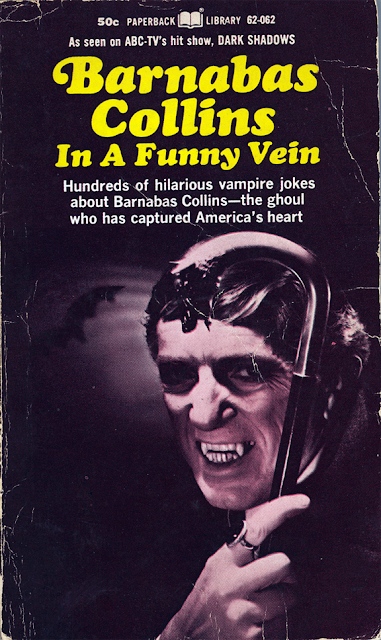 BARNABAS COLLINS fans and all those whose blood kindles at the thought of vampirism, hear ye! A darkly memorable date in the annals of daytime television history is rapidly approaching: April 14, 1968. On this day, television's most macabre matinee idol will celebrate his first anniversary on ABC-TV's weekday drama series, DARK SHADOWS. 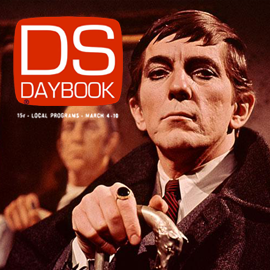 It was just one year ago that Barnabas Collins, alias actor Jonathan Frid, made his first appearance on ABC-TV's eerie series seen weekdays in color from 3:30 to 4 p.m. He was originally slated to hover around for just 3 weeks but he created such a great flap that Barnabas stayed … and stayed … and stayed. The 175-year-old vampire has become so popular with daytime television viewers that recently he signed a new contract to stick with the series for at least 2 more years. His malevolent magnetism spreads from coast to coast and encompasses fans of all ages. And don't think that his impending First Anniversary has been ignored by his followers. Many of the letters he has been receiving lately have focused on this important date. 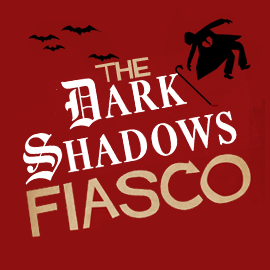 In fact, Frid did not recall the exact day on which he joined the DARK SHADOWS cast until his fan mail brought it to his attention. 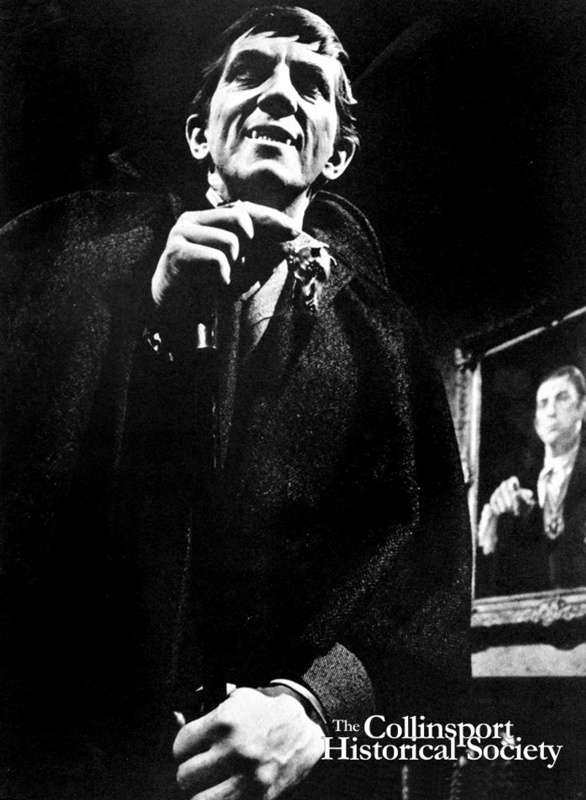 "I cannot let your first year's anniversary as Barnabas Collins on DARK SHADOWS go by without doing something about it. I shall never forget the first time you appeared on the show. From that instant on, I was hopelessly 'hooked' on this outstanding series! "Your mystery and magnetism make DARK SHADOWS irresistible. In your matchless way, you have managed to captivate hundreds of thousands — nay, millions—of hearts. "And so, in my small way of saying 'thank you' for a year of splendid acting, and a superb portrayal of an extremely difficult part, I am sending you a plaque which I hope will bring you as much pleasure looking at it, as it did for me in having it made up for you. "Happy anniversary, Barnabas! May you have many, many more in the future." 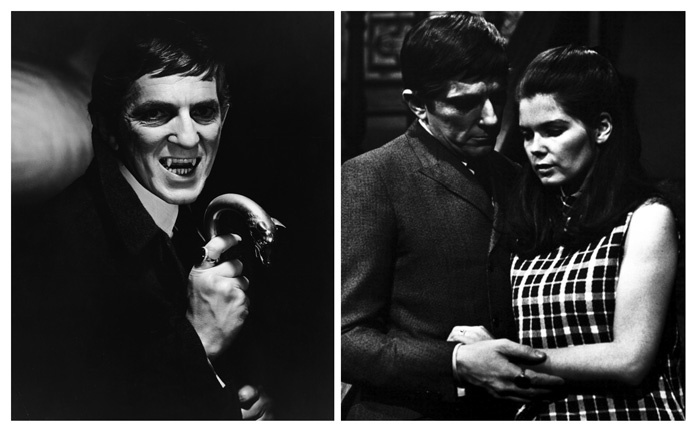 What is Frid's reaction to the tremendous stir he has created with his portrayal of Barnabas Collins? "It's simply ghoulish," he says with a sinister smile. Jonathan Frid, far left, holds a copy of this issue of Famous Monsters. What happens when you cross a vampire with an elephant? You get a bat that can spend the daylight hours in its own trunk or an elephant with the world's biggest nosebleed. What happens when you cross a vampire with a volkswagen? You get a Volkswagen that gets 50 miles to the gallon—of blood. What happens When you cross a vampire with a turtle? You get the world's slowest vampire. What happens when you cross a vampire with a stream? You don't know much about vampires if you don't know they can’t cross running water! What happens when you cross a vampire with a hippopotamus? You get a hippopotamus that casts no reflection in a mirror. What happens when you cross a vampire with a dinosaur? You get a vampire that's been undead for millions of years! 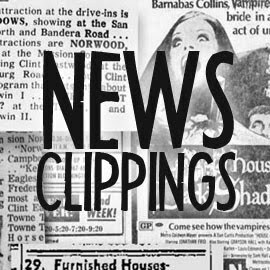 What happens when you deduct a pair of vampires from 50 cents? You get two bats change. What happens when you cross a vampire with a train? How does a vampire keep his children entertained? He sends them out into the yard make blood pies. Do you know what happened when Voivode Dracula and Barnabas Collins met for the firstime? What did Barnabas protest when he blundered into another vampire's burial place? What happens when you cross a vampire with a necklace? The vampire develops beady eyes. How can you tell when a vampire has been in the bathtub? He leaves a red ring. 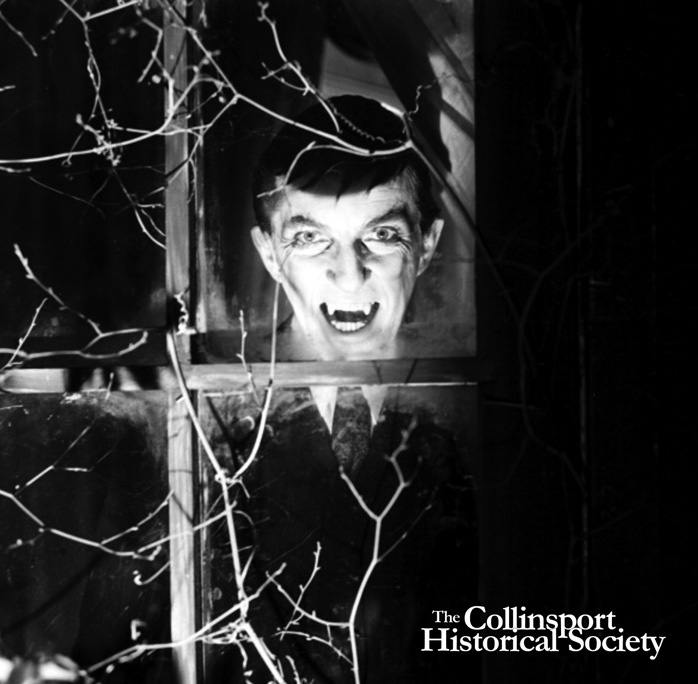 What did Barnabas Collins say to Larry Talbot when Hairy Larry got indigestion? Why do vampires prefer to take their meals indoors? Because a burp in the hand is worth two in the bush. 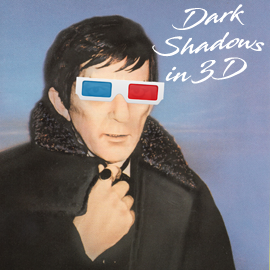 What is Barnabas Collins' favorite time of day?